Jason Bateman takes on his first film as director in this hilarious tale of a middle-aged dropout who finds a loop hole that allows him to register into a children’s national spelling bee competition. Bateman, who also stars in the film, takes on his young competition in a cutthroat race to the finals. This is a filthy and vulgar film but it is great fun. It’s a film about redemption, friendship, family, and how wonderful it can be if we let our protective guard down and learn to let go. 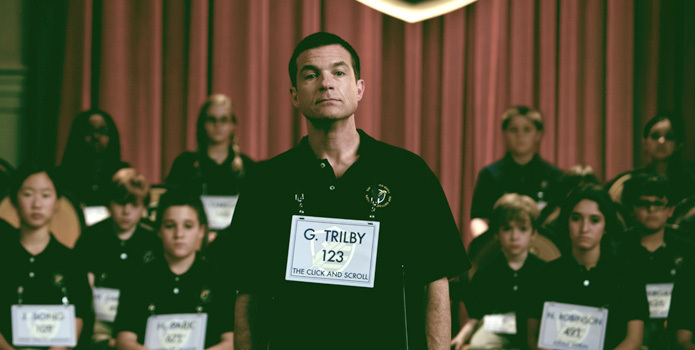 Guy Trilby (Bateman) is a forty-one-year-old school dropout who finds a loophole in the rules of a national spelling bee that allows him to become a competitor. The rules state that the competitors can not have moved past the eighth grade and since he dropped out of school, he never technically passed that year, and is therefore eligible for the competition. Trilby is determined to make it all the way to finals and win the competition. In order to compete, he must have a reporter from a nationally recognized news outlet as a sponsor. His reporter sponsor, played by Kathryn Hahn, pressures Trilby for an interview about why he is on this quest but Trilby continually refuses to reveal his true motivations. Once at the national competition, Trilby is threatened by parents of fellow competitors and by the bee director Dr. Bernice Deagan (Allison Janney), but he is able to stay focused. Trilby is also befriended by a young competitor named Chaitanya (Rohan Chand), a boy just as skilled at competing as he is. Chaitanya is under tight control from his father, and has no friends at school so he is eager to become friends with the “famous” competitor. Over the course of several days at the competition, they begin to bond. Chaitanya, persistently irritating Trilby to no end, is taught to relax and not take life so seriously and Trilby learns the value of letting a friend into his life despite the age difference. The two of them go out on the town and Trilby takes him places and shows him things that are highly inappropriate for a 10-year-old, and they both gleefully enjoy it. As the competition is whittled down to the final competitors, with Trilby still in the running, the organizers of the bee become increasingly desperate. The journalist does some private investigating into Trilby’s background and as the competition comes to an end, the true intentions of why he entered the competition are finally revealed. 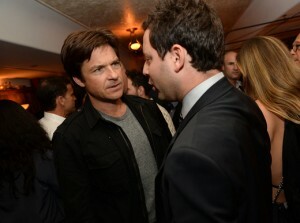 Jason Bateman at SoHo House during TIFF 2013. Bateman is a natural as a director. This project is the perfect fit for his style of acting and his sense of humour. He is working with some of the most talented comedic actors right now and directing from a very strongly written script. He shows great maturity in front of, and behind the camera and after so many years, fully understands and appreciates the process needed to craft a film such as this. Young actor Rohan Chand, who plays the 10-year-old Chaitanya, is a joy to watch. Having only done a handful of projects, he shows great maturity for his age and is able to stand strong against the experienced veterans. He handles the subject matter, normally inappropriate for someone his age, with sophistication and he and Bateman share great chemistry on screen. One can’t help but wonder just how much this kid saw and heard when making this film, and how much of an affect it would have on him. Regardless, he is charming, witty, and hilarious and one of the standouts in the film. The story could have done better with a stronger resolution on Trilby’s true intentions of why he entered the competition. The explanation is there but it could have been handled in a stronger manner so as to clear up any ambiguity. However, this does not significantly detract from the enjoyment of the film. It is uproariously funny and it is no wonder the film was quickly sold to a distributor after its well-received debut. This film will play well alongside the many recent films of similar style and manner, and showcases Bateman’s signature approach.